Spending a week-end in Levanto is ideal to discover that there is much more than the beautiful Cinque Terre, preferably in spring or autumn. The humidity level is lower, the area is less crowded compared to high season and you can enjoy the plethora of activities that this village and its surroundings have to offer. During the two days I spent here I chose to move around exclusively on foot or with my bike, focusing my attention solely on the landscape of Levanto, Framura and Bonassola. By doing so I was able to forget the stress of my daily routine and calmly enjoy the beauty of the local scenery. 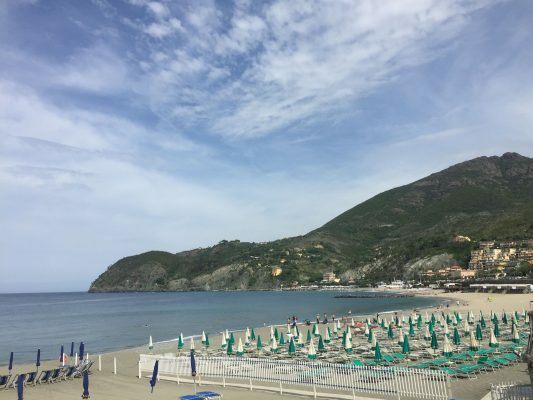 But what can you exactly do in Levanto in just two days? Almost everything, from hiking along the seaside to tasting local dishes and wine. Levanto truly has a lot to offer! For the sports lovers, Levanto can boast 80 km of trails that allow you to hike along the coast or climb the hills above it. There are a multitude of trails at your disposal, with varying levels of difficulty. I undertook part of the trail from Levanto to Monterosso, passing through Punta Mesco, a headland overlooking Cinque Terre and the Golfo dei Poeti, also briefly visiting the Podere Case Lovara. It is an ancient farmhouse perched above the sea, recently restored and surrounded by vineyards, vegetable gardens and olive groves thanks to the newly rebuilt terracing around it. This place can only be reached on foot and it is an ideal resting point for a picnic with view. To return we chose the trail that climbs to Colla Bagari and then descends towards Levanto, while admiring a breathtaking sunset. Levanto also has much to offer to the less active visitors. You can walk around the tiny old town, which is full of details about the history of the Republic of Genoa and other anecdotes. For example the many painted windows on the facades of the historical buildings, due to the fact that, in the 18th century, the republic of Genoa established a “window tax”. Be sure not to miss the walkway along the old walls, known locally as “passeggiata degli orti di San Giacomo”, reminiscing the history of the Sea Republics the wars between Pisa e Genoa. Along the walk you will spot the well preserved Clock Tower and the Shrine of St. Jacob, another must visit. The sea is another main character of the landscape around Levanto. The beach is not huge but still has everything you need to relax under the sun. The water is clean and the bathing establishments can be easily reached by foot or bike. The true gem, however, is the bike trail “Maremonti”, a former railway line that now connects the towns of Levanto, Bonassola e Framura. Jump on your bikes and ride through it, stopping every once in a while to discover tiny beaches or visit the small fishing port of Framura and the “Pidocchio” beach. In Levanto you can enjoy the aromas and tasted of the Liguria culinary tradition, especially after some kind of workout. Very often you will see boots and trekking sticks under the tables of one of the local bars that welcome tired but happy visitors every day. During your weekend in Levanto is mandatory to try a local “aperitivo” to get to know the local wines, for example at the wine shop La Compera, situated in a hidden and charming small square, in the heart of the old town. Here the choice is wide and ranges from the local Bosco, Albarola e Vermentino to a selection of very interesting regional brands. The local food is likewise very interesting. One of the best local dishes is the gattafin, a kind of deep-fried ravioli filled with wild herbs, onion, eggs and cheese which are served often as an antipasti or accompanying an aperitivo. And you can only imagine the rest! Being in Liguria the real star is the pesto sauce, a culinary symbol of the region and its traditions, usually paired with trofie. pesto sauce is very serious business in Levanto and Liguria in general. You do not mess with the recipe, as if it was a proper ritual to be followed in all its details. At the Nicchia Pestifera, located just a few steps away from the seaside, is possible to learn the true recipe, passed down from mamma Luigina to her daughter Monia. Thanks to their expertise, by attending a very tasty workshop you will be able to become a true pesto master for a day.